Cavium was showing off the goodies at MWC including an Octeon Fusion fusion picocell reference design. The rest ranged from end-user dongles to 40Gbps line cards, enough of a span to safely call it top to bottom. 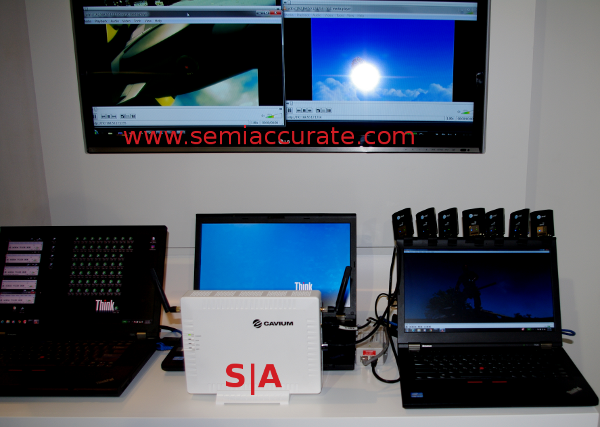 The first demo was the most impressive, it is a demo for their Octeon Fusion picocell/home gateway device. It starts with a 4-core MIPS CPU running between 450MHz and 1.4GHz depending on model, and puts a DSP on die. That is the base 65nm Octeon Fusion chip, and the picocell looks like the reference design shown below. Currently, each box can handle 64 users, but Cavium expects to up that to at least 128 as the software is further optimized. The interesting part is power. You can see this reference design is pushing eight HD video streams through it, but there is no electrical connection to the box. It is fully capable of running those load levels supplied only by Power over Ethernet (PoE). That means the full picocell is pulling no more than 25.50W, the max that an 802.3at Type 2 port can deliver. Not bad at all, especially considering the radio broadcast needs. A little bit farther up the performance ladder is this Octeon II board, it has two CN6880 CPUs on it. 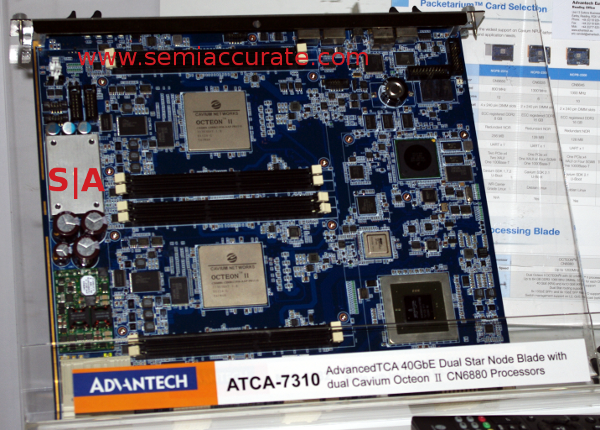 It is an ATCA 40Gbps line card made by Advantech, and that would be 40Gbps packet processing per socket, 80Gbps for the card. Cavium lowballs the performance though, only publicly claiming 77Gbps thoughput. Not bad for 64-cores running at 1GHz with 64GB of RAM, and really not bad considering it only pulls 200W total. Try that with your PC and watch it choke. 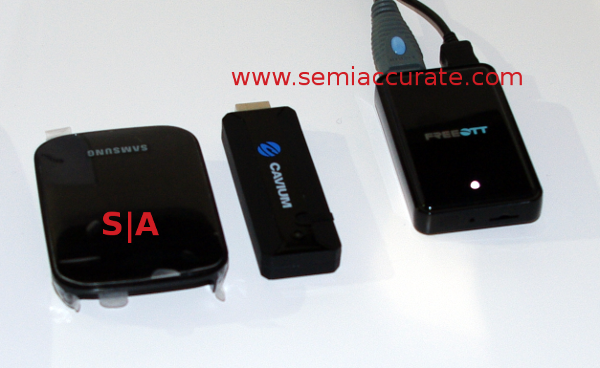 The last device is at the complete opposite end of the market, a consumer oriented DLNA dongle. Miricast devices seem to be a dime a dozen lately, but Cavium was one of the first to have products on the market years ago. If you have been to a lot of trade shows, you probably recognize the form factor of the Samsung DLNA device on the left, this design has been rebadged by a lot of OEMs. To its immediate right is the newest form factor reference design which was shown off by ZTE at MWC with sales starting soon. The far right version is another reference design, take your pick. All three go by the name Cavium OTT, but once an OEM picks them up, don’t look for that slogan anywhere.